Apocalypse! is here! Are you ready to face the end of the world? 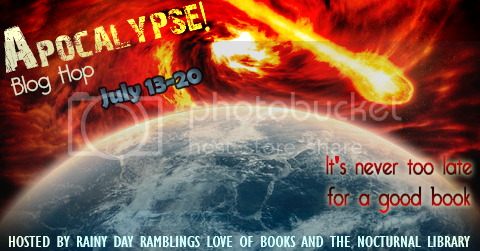 My blog is loaded with terrific and terrifying apocalyptic reads and giveaways all next week. My two co- hostesses, Christy and Maja also have awesome apocalyptic line ups. I hope you all will follow along and enjoy Apocalypse! Aside from Apocalypse! there is plenty of stuff going on! I participated in the Once Upon a Read A Thon and managed to read three books. I also hosted a really fun Apocalyptic Jigsaw Puzzle Challenge that you can still enter. My Shelf Confessions is hosting a big month long event in August: Vamps vs Zombies. There is a giveaway blog hop, read a thon and more. So head over and sign up! My Lady Book Stuff is hosting a Bully Awareness Campaign in October head over to her blog and sign up. This is a great way to help prevent bullying. I ran across a very interesting post on Parajunkee's blog regarding Blogger blogs being marked as spam and deleted with no warning especially if they have any kind of adult content regardless whether or not you have the warning posted. If you have a blogger blog, you need to take some time and read this article and protect your blog. Tuesday: Tell Me Something Tuesday: Sleeper Books Why Aren't More People Reading This Book? What are some of your picks? I got this as Kindle Deal for $2.99! Saturday: The FIfth Wave by Rick Yancey Review and Giveaway... wrap up of Apocalypse! Be sure to stop by and add your links to your apocalyptic posts daily. Have a great week everyone! Enjoy Apocalypse!